Mutton Chilli Fry recipe by Sajida at PakiRecipes.com. Red Chillies(broken into bits) 5. Put all the above ingredients except tamarind water in a pan and cover tightly. Cook without adding water on a slow fire and till the mutton is tender. Add the tamarind water and let it dry. 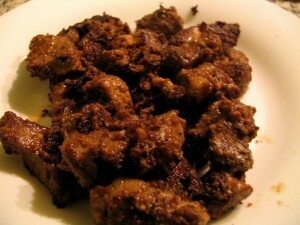 Put oil and fry the mutton to a nice brown color. Serve hot with chappati or naan.